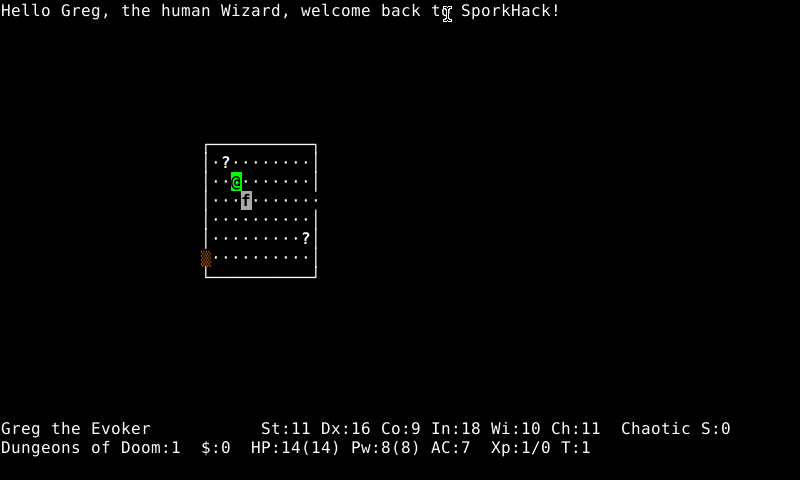 SporkHack, at sporkhack.com, is a variant of Nethack 3.4.3 by Derek Ray aimed at game balance. Its stated purpose is to "try to make the game more interesting for experienced/skilled players, while making it no harder...for the newbie." . It can be played on a public server at sporkhack server. To discuss, join #sporkhack on freenode. "I've been working on a fork of 3.4.3 that has a number of balance-oriented changes, largely to try to address the problems I've outlined in prior posts as well as just provide a platform for experimental changes. It's been in test among a small group of players for about a month now; it seems time to open it up and see what others think. In short, one of the purposes of this fork is to try to make the game more interesting for experienced/skilled players, while making it no harder (or, in a couple cases, slightly easier) for the newbie. It's also going to be an attempt to try to increase variety in the standard 'ascension kit', since right now it is pretty well defined. There is a server available for play at this telnet link; the very rough changelog and description can be seen at this webpage. A patch to match the server state will eventually be published on the website as well, once I confirm that the patches will properly apply to a vanilla 3.4.3 distribution. There is a channel #sporkhack on irc.freenode.net where discussions take place relatively frequently; there is a bot there, much like #nethack's Rodney, who will announce deaths and ascensions as they occur. Please keep in mind that these changes should be considered to be alpha- or beta- level; there may well be bugs, and these bugs may affect your gameplay. I do try to fix bugs found as rapidly as possible, but I can't always update the server immediately since I have others' games to consider as well, especially if I have a patch in the queue that will break savefile compatibility. This is a live fork! For the near future, I will still be making a great deal of changes, and if an imbalance is found with existing changes, they are not set in stone -- if something is too hard, I will certainly consider toning it down to a more reasonable level. By the same token, if something I add makes things too easy, I will probably tone _that_ down too. SporkHack, at sporkhack.com, is a variant of Nethack 3.4.3 by Derek Ray aimed at game balance. Its stated purpose is to "try to make the game more interesting for experienced/skilled players, while making it no harder...for the newbie." . It can be played on a public server at sporkhack server. To discuss, join #sporkhack on freenode. From the original developer's announcement on rec.games.roguelike.nethack, 8 July 2007: "I've been working on a fork of 3.4.3 that has a number of balance-oriented changes, largely to try to address the problems I've outlined in prior posts as well as just provide a platform for experimental changes. It's been in test among a small group of players for about a month now; it seems time to open it up and see what others think. In short, one of the purposes of this fork is to try to make the game more interesting for experienced/skilled players, while making it no harder (or, in a couple cases, slightly easier) for the newbie. It's also going to be an attempt to try to increase variety in the standard 'ascension kit', since right now it is pretty well defined. There is a server available for play at this telnet link; the very rough changelog and description can be seen at this webpage. A patch to match the server state will eventually be published on the website as well, once I confirm that the patches will properly apply to a vanilla 3.4.3 distribution. There is a channel #sporkhack on irc.freenode.net where discussions take place relatively frequently; there is a bot there, much like #nethack's Rodney, who will announce deaths and ascensions as they occur. Please keep in mind that these changes should be considered to be alpha- or beta- level; there may well be bugs, and these bugs may affect your gameplay. I do try to fix bugs found as rapidly as possible, but I can't always update the server immediately since I have others' games to consider as well, especially if I have a patch in the queue that will break savefile compatibility. This is a live fork! For the near future, I will still be making a great deal of changes, and if an imbalance is found with existing changes, they are not set in stone -- if something is too hard, I will certainly consider toning it down to a more reasonable level. By the same token, if something I add makes things too easy, I will probably tone _that_ down too. I hope you enjoy it." - added an xmodmap so that d-pad can be used for movement keys. Update doesn't show up as an update in PNDManager.